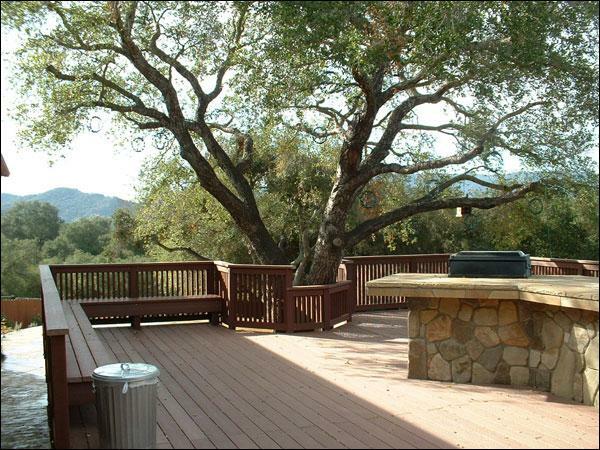 Wood, Synthetic, and Composite Decks | Haney Landscaping, Inc.
We design and build custom redwood decks, synthetic and composite decks, hillside wood decks and specialize in custom high-end decking work in Santa Barbara, Carpentaria, Ojai, Ventura, Camarillo, Oxnard, Thousand Oaks, Westlake Village, Agoura Hills and Newbury Park. There's a vast array of decking available, and some of it doesn't even have a trace of wood in it. Why all the options? It's part of our never-ending quest to make things better, easier and more convenient. Composite decking is typically made from wood and plastic, which is processed to give the appearance of real wood. Both the wood (which consists of lumber industry byproducts like sawdust, chips and wood fiber) and the plastic can be made from virgin or recycled material. Composite decking materials truly have improved over the last decade. Most old problems like mold and mildew have improved. Nevertheless it is important to find a product that has a good warranty in case of a problem. Wood-plastic composites (WPCs) are composite materials made of wood fiber/flour and plastic. In addition to wood fiber and plastic, it can also contain other ligno-cellulosic and/or inorganic filler materials. WPCs can also be referred to as natural fiber plastic composites or natural fiber reinforced plastics.